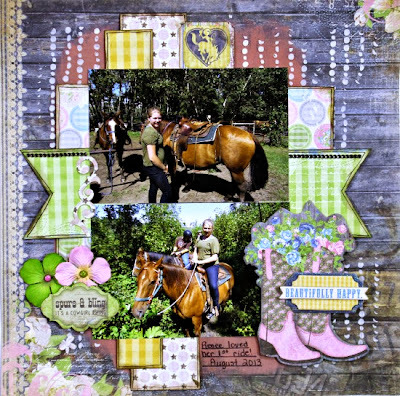 The challenge over at Boy Meets Girl was to do a layout of a girl using texture on your layout! I had these photos of Renee from her very first Horseback Riding experience! She had an absolute blast and couldn't stop talking about how much fun she had. I used some Bo Bunny papers and embellishments for this one. The texture I added was some craft paint behind my photos and then used some modelling paste with a stencil to add the lines of dots. Absolutely stunning layout! I love all the layers. So glad you joined in the fun over at Boy Meets Girl!! Perfect papers for your photos! Beautiful LO. Thanks for joining us at Boy Meets Girl. This is an absolutely beautiful page. I really love the color scheme and the gorgeous boot embellishments. Great take on this challenge, beautifully done! Thanks for joining us at BMG! Love all the layering you did Char. The strips are fabulous! Love, love all the texture you added and your elements. My new fave Char page! Gorgeous layout Charlotte. Love the colours, they blend in beautifully with the photo. Thanks for playing along with us at BMG. Fabulous papers choices and such fun photos! I love all the layering and the stenciled dots! Thank you for participating at Boy Meets Girl!!! Hi Char-was just over posting at Boy Meets Girl and spotted this-love the pp strips and the use of the static stencil!! Great photos and page! This is amazing!! Thanks for playing along at BMG! Beautiful Charlotte.......wow, the detail is amazing, great photos!